Stacy Horn » Blog Archive » My TV is BACK! Backstory: My Time Warner cable has been down since Monday due to a broken cable on the roof. It began badly. The foreman comes up the stairs empty-handed and alone. “Where are your tools?? The technician? 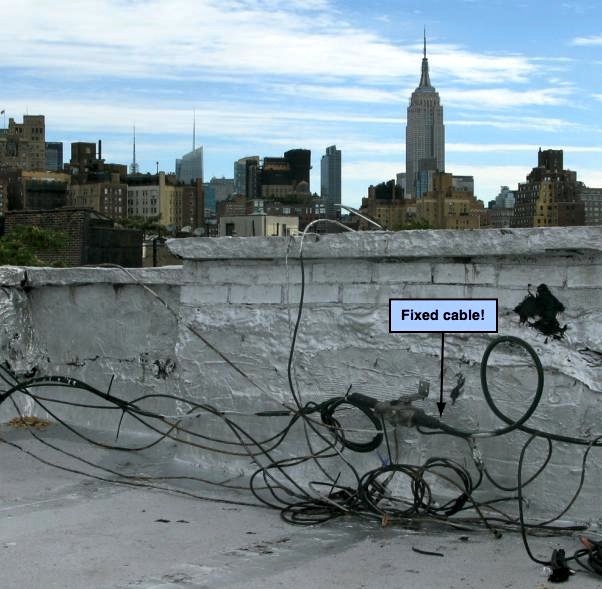 ?” “I have to verify there is a broken cable on the roof.” They know there’s a broken cable on the roof because their own technician discovered it and I sent them a picture of it. Nothing is going to get fixed. I start to sob. But this was super foreman! We get to the roof. “Yeah, you have a broken cable,” he says then climbs over to the roof next door. I tried to stop him, I swear. I don’t want my tv that bad that someone must die for it, but he was all “I have a family, I wouldn’t do this if it was really dangerous, don’t worry, I’ve been doing this for a billion years.” He finds an extra cable, disconnects my cable from the broken cable, hooks it up to another tap and I am back in business! My internet connection slows down, but he tells me this is just a temporary solution and he will get someone back on Wednesday to fix everything properly. A half an hour or so later he’s back with some plant guys. The plant guys look around at the mass of old, kinked and semi-brokens cables all over the roof, scream, then say everything has to be ripped out and completely redone. Before they go though, they FIX my broken cable and hook me back up. My internet connection is better but still slow but apparently all will be well next week. Everything is back in time for the Emmy’s! I wish I had taken these guy’s names so I could laud them for the great work they did. Actually, I can get their names on Wednesday. Thank you guys. I can’t believe all those cables are exposed! In my building, the Time Warner connectors are in locked, steel boxes on each floor. I guess I live in a city of crooks. Here’s something you should know: all channels and premium stations are on your cable. There’s an easily-identifiable FILTER that blocks out those channels for which you do not pay. I understand there used to be quite a market here on FAKE filters which let everything through but looked like the real thing to a passing service person. I don’t care because I only watch the news. I think they call mine, “Third World Cable” – in other words, the MINIMUM basically for reception. Now if Finney were to unscrew the filter, use it for a cat toy, and rehookup the cable . . .
(I’m just saying)…you just can’t tell with cats! BTW, you might wish to run through all of your channels to see if “extras” are causing your slowdown. It’s my internet connection which is slow, not the tv, but I’m curious which extras you mean. Yeah, the cables are all over the place on my roof. All the cable “tiers” are on your cable – most are blocked. If you run through the channels via your remote, you may find channels you didn’t think you “had” because of the impromptu hook-up. (This has happened to me and it was months before I knew it because I never thought to look). PS – if your remote is programmed only to the channels you’ve purchased from TW, put in a few “higher” numbers to see if you now have some premium channels. Press 55, for example. I’m making a big assumption here – your TV and your internet connection are coming from the roof on the same cable – like mine. If they do not, your ‘e’ makes much more sense and I’m sorry for the misinformation. The channels on my remote go up to 999. All the HD channels are in the 700’s, for instance.